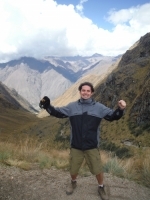 I enjoyed seeing: the glacier, the condors, and the Inca monuments. Quite seriously, those are easily the best part of the trip. 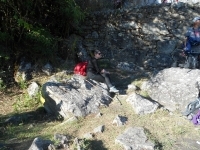 The hikes are difficult on your knees, and be careful to apply lots of sunscreen and mosquito spray. You will definitely need it in the humid jungle environment. Note: Alternate titles include "The Raultimate Adventure" and "No, I seriously want more Lomo Saltado"
In seriousness, the trip was well managed and expertly led by Raul Coronel. Like Odysseus, we were far from home when we embarked on the quest. We also had very little Wi-Fi, so Homer would have had a field day with this voyage. 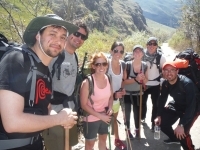 A tough and very rewarding hike for the over 50 set. The second day is touted in advance as very difficult, and though that's somewhat true, it is certainly well worth the effort. I love hiking the mountain. It is uphill - I keep fast walking. It was good view of the mountains such as Llactapata, Phuyupatamarka, etc. 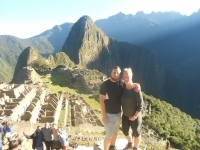 I'm with my deaf friends, we were concern about communicating with Juan, but he did an excellent job to communicate with us by write down on paper also speak slow for us, he made sure we understand everything about Machu Picchu. We had a wonderful trip from start to finish. 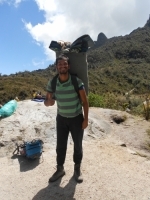 Our guide, Juan Carlos, was kind, patient and informative making for a really great time. 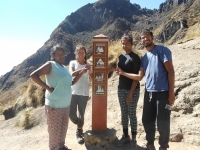 Juan went out of his way to make sure everyone in our group felt comfortable and we never felt rushed as we explored the Inca Trail. I am deaf, Juan Carlos welcome us greatly and respect us that we can't speak or hear. He kindly bring pen and paper to write down the information we need. We are impressed with his service. 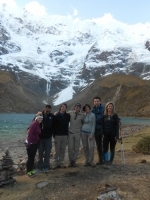 My experience with Inca Trail Reservations doing this trail was absolutely fantastic! Our guide, Juan Carlos, was amazing. 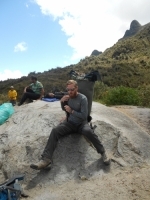 He paid attention to every detail of our trek, making sure that each person had what they needed. 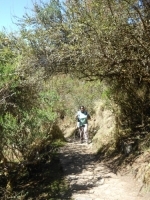 He also shared a lot of knowledge about each part of the trail. I learned a lot of history and naturalist information. 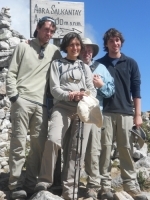 The Inca Trail was an amazing trip I would highly recommend for anyone to do. The track is challenging but people of all ages are able to do it. 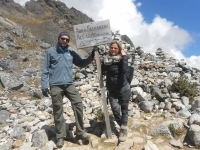 The views and sites you will see are spectacular and extremely rewarding to see once you reach them.The hospitality and service from Inca Trail Reservations was of a very high standard. The whole trip was excellent. 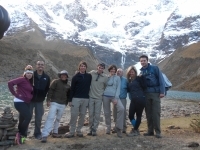 It had been very well organised by Inca Trail Reservations and the guides and porters were helpful and efficient. 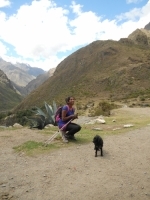 We were provided with tasty and plentiful Peruvian food at meal times and whenever we came across a historical Inca site, the guide was always at hand to give us interesting information. A aventura comecou na chegada a cusco. Tudo no Peru e incrivel. Machu Picchu tem uma energia unica. Garotinho carlos, como apelidamos nosso divertido guia, foi otimo sempre preocupado se estavamos bem e sempre muito claro em suas explicacoes sobre os sitios Incas. Acabamos de fazer a melhor aventura da minha vida. Eeta trilha ė muito maravilhosa. Todos os Portadores e Guias foram muito prestativos. Eles foram muito amigos. Tambem gostamos muito dos amigos de todo o mundo que estavam tambem fazendo a trilha. Havia uma energia muito boa no lugar.